The theme of the sermon was that nothing physical endures. Even empires do not last; entire civilizations come and go. So it would be presumptuous to assume that the modern state of Israel is a permanent fixture, not subject to the vicissitudes of human history. But the trick of life, Rabbi Wolpe argued, is to value something while you have it the way you will value it when it is gone. So many things in life we appreciate only when we no longer have them -- valuing them retroactively because we took them for granted while they were here. So, the sermon concluded, we need to think about Israel, and what it means, and what we would give to have it if we did not already have it. And then we need to do that, in order to keep it. Israel is in still another unsought war, against fanatical and well-armed proxies of Iran and Syria, operating from areas Israel gave up for “peace,” backed by a soon-to-be nuclear state with a messianic commitment to genocide, using the most barbaric tactic in human warfare -- intentionally indiscriminate attacks on civilian populations -- while hiding behind human shields, watching as an amoral world debates whether Israel’s defense is “proportional” or taking too long. What can we do? Well, the least we can do is go there. That question, asked by Moses of the tribes Reuven, Gad and half of Menasseh, is particularly pointed on this day. That is why I am writing these lines while preparing to board a plane for Israel. Moses accepts that the tribes may live outside the land, but insists that they must help to liberate the land, for that historical mission is tied to all the people. So thirty-five [now nearly 50] people from Sinai Temple are going, and we are bringing with us a million dollars to help soldiers, their families, and other urgent causes. The money was raised and the trip organized in two weeks. Because we are not permitted to sit here while our sister and brothers are at war. In difficult times, some people are cancelling trips to Israel. They should be planning more trips. We should be pouring money into the land, to help the soldiers, those who are displaced, those who need our help and wish to know that, in an often hostile world, they are not alone. Each Jew who lives outside the land of Israel owes a tax to the land. We owe a tax for not living there. For all the services we receive from the land of Israel, that our people receives, do not come free. . . .
We will be visiting soldiers, people who have been injured, children and adults -- our family. . . . Do not sit there while your sisters and brothers are at war. And so here we are, on the plane to Israel, reciting the Traveler’s Prayer for peace and grace (thank you Anne), going there to do what we can, to help keep it. We arrived this afternoon on a 12-hour El-Al direct flight (the cabin erupted in applause on landing), and traveled from Ben-Gurion Airport near Tel Aviv up through Route 443, through the hills of Samaria, along the security barrier, approaching Jerusalem from the north to view its panoramic outline from Mt. Scopus. Then over to the Wall to thank God for our good fortune in reaching this day, and to rest our heads against the Wall in prayer, and then back to the modern glass and stone David Citadel Hotel, where Condoleeza Rice stayed this weekend, attempting to create the conditions for a lasting peace that, as the Wall reminds us, has eluded every generation before. Then dinner with General (Res.) Itzhak Eitan, the International Chairman of the Friends of the Israel Defense Forces, joined by the family of Gadi Musayev (killed on July 12, 2006 -- one of eight soldiers murdered that day by Hezballah in the initial act of this latest war), a moving musical tribute by violinist Lior Kaminetsky from the Jerusalem Academy of Music and Dance, and a sobering speech by Rabbi Daniel Gordis, a kind of follow-on to his latest stunning dispatch. More about that later. For now, I need to get some sleep. We have wake-up calls scheduled for 5:45 a.m. tomorrow. The bus leaves at 7 a.m. for a series of events that will not bring us back to the hotel until 11 p.m. -- visiting a Jewish Agency Summer Camp for children from the North, visiting the Bnai Zion Medical Center, visiting wounded soldiers, having dinner with bereaved families, and more. There is a lot to do. Off until Monday -- in the meantime, just go to Boker tov, Boulder! Amir Taheri, in The Times, on "God's Army Has Plans to Run the Whole Middle East:"
The mini war that is taking place between Israel and Hezbollah is, in fact, a proxy war in which Iran's vision for the Middle East clashes with the administration in Washington. What is at stake is not the exchange of kidnapped Israeli soldiers with Arab prisoners in Israel. . . . The real issue is who will set the agenda for the MIddle East: Iran or America? Over the next few weeks, we will be watching history unfold. “Leonard Cohen: I'm Your Man” is a seamless tribute/documentary/concert film about the man who first encountered poetry in the Jewish liturgy at his family’s synagogue, and who in the course of a painful life became a monk, left the monastery and is still singing today. More than four months after the 2004 election, the Center for American Progress and the Century Foundation asked self-described liberals and conservatives to rate their top two foreign policy goals. Conservatives were 29 points more likely to mention destroying Al Aqeda, 26 points more likely to mention nuclear weapons to hostile groups or nations, and 24 points more likely to mention capturing Osama bin Laden. In fact, while conservatives, and Americans in general, cited destroying Al Qaeda as their highest priority overall, for liberals, it tied for tenth. . . .
That conclusion was underscored by a November 2005 M.I.T. survey, which found that only 59 percent of Democrats -- as opposed to 94 percent of Republicans -- still approved of America’s decision to invade Afghanistan. And only 57 percent of Democrats -- as opposed to 95 percent of Republicans -- supported using U.S. troops “to destroy a terrorist camp.” . . . .
America badly needs an alternative vision -- rooted in the liberal tradition -- for fighting global jihad. And yet the liberalism emerging today denies that fighting global jihad should even be a priority. Actually, there already is a vision rooted in the liberal tradition for fighting global jihad. It’s called neo-conservatism. If by “liberals,” Beinart means “progressives,” he should drop the subtitle of his book when it comes out in paperback. His book pretty much proves the opposite. QUESTION: Why not call for a cease-fire until you can get back on that political path? QUESTION: -- you want the violence to end? SECRETARY RICE: I can tell you that -- of course, we want violence to end. But I can tell you right now if violence ends on the basis of somehow Hezbollah or Hamas continuing to hold in their hands the capabilities anytime they wish to start launching rockets again into Israel, if violence ends on the basis of no change in the underlying political support for Resolution 1559 or for the work that President Abbas is doing, if violence ends on the basis of Syria and Iran being able to turn on the key again anytime, we will have achieved very, very little, indeed, and we will be right back here, perhaps in a worse circumstance because the terrorists will assume that nobody is willing to take on what has been a very clear assault now on the progress that is being made by moderate forces in the Middle East. . . .
And I want to say just a word about this notion that somehow this all arose in the last couple of years, because we've been calling for democracy and things have gotten stirred up in the Middle East. There was a false stability in the Middle East over the last several years that produced a set of circumstances and an atmosphere so malignant that you had the rise of extremist forces like al Qaeda. So the notion that somehow the Middle East -- which has, of course, been a violent place now for any -- for a lot of years -- that the Middle East was somehow undisturbed, and because now we are fighting extremism, because now we are pressing for a democratic voice for the people of the Middle East, that somehow that has now caused the current crisis I think is grotesque. What you had in the Middle East before was American policies -- bipartisan, by the way, it had been pursued by Democratic Presidents and by Republican Presidents -- that engaged in so-called Middle East exceptionalism and was pursuing stability at the expense of democracy, and it turned out . . . was getting neither. . . .
And it will be difficult, but we are at an important juncture right now, because extremists have showed their hand. . . . That's what's really happened here. And they've showed that their sponsors are in Tehran and in Damascus. Things are clarified now. One of the interesting things about this recent flare-up is that it helps clarify a root cause of instability in the Middle East -- and that's Hezbollah and Hezbollah's relationship with Syria, and Hezbollah's relationship to Iran, and Syria's relationship to Iran. Therefore, in order to solve this problem it's really important for the world to address the root cause. . . . [O]therwise there may be apparent calm and then all of a sudden there will be more conflict. . . .
[T]his is a moment of clarification. It's becoming clear for everybody to see some of the root causes of instability. . . . [O]ne of the interesting things about this moment is it's now become clear to a lot of people why we don't have peace in the Middle East. It's a moment of clarification. And therefore, it's a moment that requires all of us to work together, to send a clear message, not only to Hezbollah, but to the Iranians, who finance Hezbollah, and to the Syrians who house Hezbollah. . . .
And I repeat, there are two nation states that are very much involved with stopping the advance of peace, and that would be Iran, and that would be Syria. Bush and Rice, like Reagan before them, are hedgehogs (Natan Sharansky is another one). In the end, they have a greater historical impact than the foxes struggling with their long lists of nuanced issues. In her latest book, Albright, the former secretary of state, says she remembers coming across articles in foreign policy journals "about 'Islamic extremists' " throughout the 1990's and, "in meeting after meeting," she'd find herself "scrawling on a notepad, 'Learn more about Islam.'" She can cross it off her to-do list. . . .
What exactly is the criterion by which one measures the proportion of more than a thousand missiles shot at innocent civilians against the measures that were taken by the State of Israel in the last few days? Can one measure the anxiety, the fear, the shocks, the lack of security of tens of thousands of people living day-in and day-out for almost a year under the constant threat of missiles shot at them? When was the last time that the European Union condemned this shooting and suggested measures, effective measures to stop it? We were waiting and waiting and waiting and everyone knows that Israel pulled out entirely from Gaza precisely in order to try and establish a new basis of cooperation and understanding with the Palestinians, when there can be no claim for any territory by the Palestinians in the south part of the country. And the response was terror and terror and terror and terror again. So at some point Israel had no choice but to take some measures in order to stop this threat. Israel 's military invasion and naval blockade of Lebanon is being denounced in European capitals and at the United Nations as a "disproportionate" response to the kidnapping this week of two of its soldiers by Hezbollah. Israel's decision late last month to invade Gaza in retaliation for the kidnapping of another soldier by Hamas was also condemned as lacking in proportion. So here's a question for our global solons: Since hostage-taking is universally regarded as an act of war, what "proportionate" action do they propose for Israel? In the case of Hamas, perhaps Israel could rain indiscriminate artillery fire on Gaza City, surely a proportionate response to the 800 rockets Hamas has fired at Israeli towns in the last year alone. In the case of Hezbollah, it might mean carpet bombing a section of south Beirut, another equally proportionate response to Hezbollah's attacks on civilian Jewish and Israeli targets in Buenos Aires in the early 1990s. We aren't being serious, but neither is a feckless international community that refuses to proportionately denounce the outrages to which Israel is being subjected. 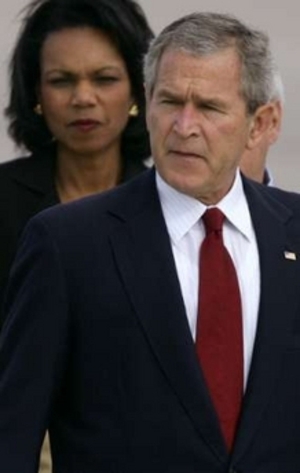 That goes also for Secretary of State Condoleezza Rice, who says "all sides must act with restraint." But Israel 's current problems result in part from an excess of restraint in responding to previous Hamas and Hezbollah provocations. There's this reflex among journalists and diplomats to urge restraint on both sides right after an attack occurs. Which would be reasonable, if it wasn't almost always the case that the first attack is committed by Israel's enemies. So in the actual context of the Israeli-Palestinian conflict, "urging restraint" is in almost every case "urging Israeli restraint". And why would people be "urging Israeli restraint"? Usually because Israel is about to let go of that restraint in response to attack or atrocity. The Lebanese can protest that the Israelis are guilty of a massive over-reaction in their response to the plight of two kidnapped soldiers, but the Beirut authorities have only themselves to blame for allowing Hizbollah to maintain a permanent armed presence in southern Lebanon. . . .
For all the goodwill that attended the emergence of the first truly independent Lebanese government for more than 30 years, the Lebanese have singularly failed to rein in Hizbollah, despite repeated requests from the United Nations and Israel to curb the radical Shia Muslim militia's activities in southern Lebanon. . . . Certainly the Israelis are well within their rights to hold Beirut accountable for Hizbollah's provocative presence on their northern border, which has effectively become Iran's front line in a country it disparagingly describes as "the Zionist entity". 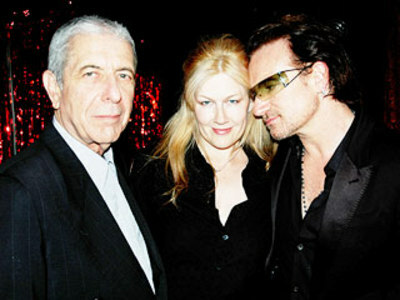 Now read David Horovitz’s brief but compelling analysis, and then read Lynn-B’s stunning post, written late last night. It placed demands on one side in the Middle East conflict but not the other. . . . Passage would also have undermined the credibility of the Security Council, which itself must be seen by both sides as an honest broker in the Middle East conflict. . . . The United States worked hard with other delegations to achieve a more balanced text, one which acknowledged that Israeli military actions were in direct response to repeated rocket attacks into Southern Israel from Gaza and the June 25 abduction of Israeli Defense Force Corporal Gilad Shalit by Hamas. Regrettably, we were not able to reach consensus. . . .
[W]e remain steadfast in our conviction that the best way to resolve the immediate crisis is for Hamas to secure the safe and unconditional release of Corporal Shalit. Establishing the foundations for a lasting peace, however, will require us to focus our attention not just on Hamas, but on the state sponsors of terror who back them -- particularly Syria and Iran. Let us be clear that without the financial and material support of Damascus and Tehran, Hamas would be severely crippled in carrying out its terrorist operations. We call upon Syria and Iran to end their role as state sponsors of terror and unequivocally condemn the actions of Hamas, including this kidnapping. We yet again call upon Syria to arrest the Hamas ringleader, Khaled Meshal, who currently resides in Damascus. We stress again our condemnation of Syrian and Iranian support of Hizballah, which has claimed responsibility for the other kidnappings along the Blue Line between Israel and Lebanon. We further call on the Palestinian Authority government to stop all acts of violence and terror and comply with the principles enunciated by the Quartet: renounce terror, recognize Israel, and accept previous obligations and agreements, including the Roadmap. . . .
[T]he issue for us is whether action by this Council makes such a solution more or less likely, not simply whether or not the Council seems to be "engaged". Ten of the 15 Security Council nations voted in favor (including France), while Britain, Denmark, Peru and Slovakia abstained. Only the United States voted against. Thank God for American exceptionalism, and its representative at the UN. Senator Norm Coleman acknowledging a standing ovation Sunday evening (RJC California Director Larry Greenfield is at the podium). 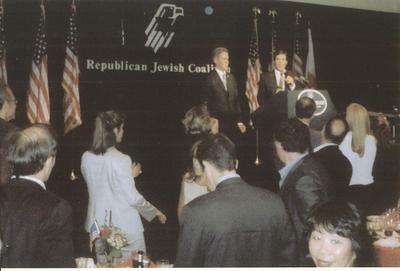 The Republican Jewish Coalition held its California Summer Celebration Sunday evening at the Ronald Reagan Library in Simi Valley. More than 500 people attended. The speakers included Senator Norm Coleman (Minnesota), Senator Mike DeWine (Ohio), and Ken Mehlman (Chairman of the Republican National Committee). When he was growing up in the 80s, his family was involved with HIAS, the remarkable organization that for more than 100 years has been engaged in the rescue, reunion and resettlement of Jews throughout the world. In the 80s, their efforts focused on the refuseniks in the Soviet Union and other prisoners of conscience there. Through dinners and meetings with dissidents, he and his family heard their stories, and learned from them about the critical role that Ronald Reagan’s famous words about the Soviet Union played. 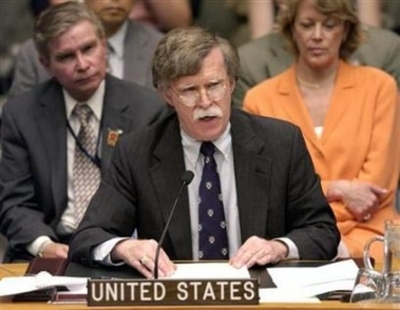 Mehlman also wondered how many people, on September 12, 2001, would have believed that, during the subsequent five years, there would not be another attack on the United States, that two of the worst dictatorships in the world would be eliminated, that Saddam Hussein would be put on trial, that his sons and successors would be eliminated, that the head of Al Qaeda in Iraq would be killed, that constitutional governments would be formed in Afghanistan and Iraq, that Libya would voluntarily relinquish all its WMD, and that Syria would be forced from Lebanon by diplomatic action. Answer: Not many would have believed that any of it would happen, much less all of it. But under the leadership of George W. Bush, it did. History is a ribbon, always unfurling; history is a journey. And as we continue our journey, we think of those who traveled before us. . . . Now we hear again the echoes of our past: a general falls to his knees in the hard snow of Valley Forge; a lonely President paces the darkened halls, and ponders his struggle to preserve the Union; the men of the Alamo call out encouragement to each other; a settler pushes west and sings a song, and the song echoes out forever and fills the unknowing air. It is the American sound. It is hopeful, big-hearted, idealistic, daring, decent, and fair. That's our heritage; that is our song. We sing it still. For all our problems, our differences, we are together as of old, as we raise our voices to the God who is the Author of this most tender music. And may He continue to hold us close as we fill the world with our sound -- sound in unity, affection, and love -- one people under God, dedicated to the dream of freedom that He has placed in the human heart, called upon now to pass that dream on to a waiting and hopeful world. Seven years after that address, the Soviet Union entered the dustbin of history. 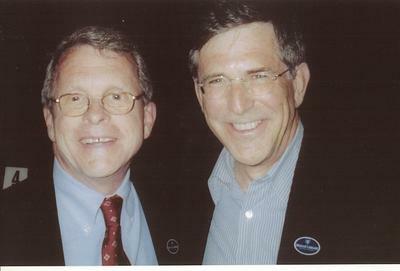 Senator Mike DeWine with the Editor of Jewish Current Issues. Senator DeWine, who is in a difficult re-election campaign in Ohio, is the person who introduced the Nazi War Crimes Disclosure Act in the Senate -- something he did not call attention to in his graceful remarks Sunday evening -- and he deserves support from our community for that Act alone. Last week when the Department of Homeland Security announced that a Lebanese man had been arrested abroad on charges of masterminding a plot -- to flood at least two tunnels underneath the Hudson River that would engulf the PATH train service between New Jersey and New York and also spill out over Manhattan almost -- no one noticed his name. Or what its message was. Well, he had chosen himself a nom de guerre that told a big story. The name is Emir Andalusi. If you want to know what it threatens, click here for an extremely informative analysis by Shelomo Alfassa, publisher of the International Sephardic Journal. The right of return, writ large.